When considering a water feature for you landscape you may have some initial concerns. If you have young children you may have concerns about a larger pond, or if you are not home often you may think that you wouldn't be able to enjoy a water feature because there would be too much maintenance involved. You may be under the impression that if your landscape is completely flat that you would not be able to enjoy a waterfall or stream cascading in your yard...but that is just not true! It's possible to have a pond, waterfall, fountain or other water feature in all types of landscapes! What Is It? A Pondless Waterfall is a re-circulating waterfall and/or a stream without the presence of a pond. Who Would Love It? Um...everyone! Families with young children, people on the go, retirees, businesses...literally any and every person would enjoy this type of water feature. What's The Maintenance? Pretty simple really, a professional cleaning in the spring along with a fall shut down is the basic maintenance program we recommend. To keep maintenance even easier; add an Ionizer, Auto Doser, or Auto Fill (to keep water levels steady). Where Could I Put One In My Yard? Front yard, backyard, side yard, indoors (yes this is possible), added to an existing pond...anywhere your heart desires really, as long as you can see and enjoy it! And if you have a small space, Pondless Waterfalls are ideal! Why Would I Want One? 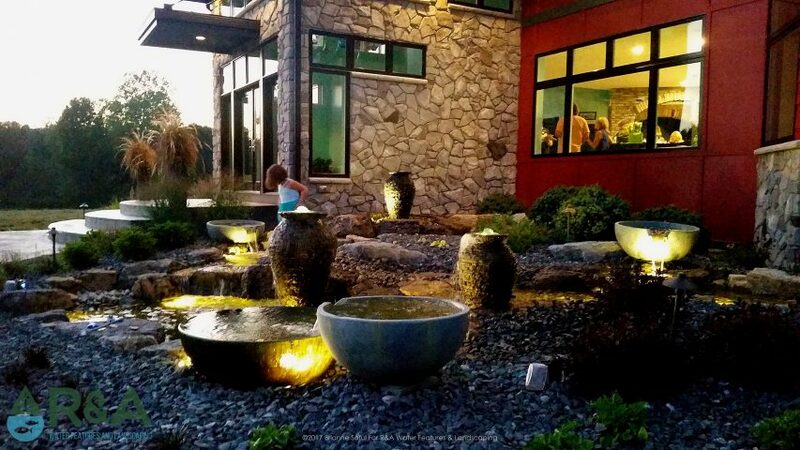 Until you've had a water feature in your yard, you don't really know what you're missing. A pondless waterfall provides the beauty and sounds of a waterfall, but without the safety concerns one might have with a bigger pond. Having a water feature, whether it be pondless waterfall, fountain, pond or otherwsie, is seriously some of the best relaxation you can get in your own landscape. How Can I Get One? Simple...call us to get started. We'll get your landscape turned into a personal paradise for you to enjoy!